St. Andrew-by-the-Wardrobe is so named because of its proximity to the Great King's Wardrobe. This 14th century mansion was purchased by Edward III and used as an office for the Keepers of the King's Apparel. 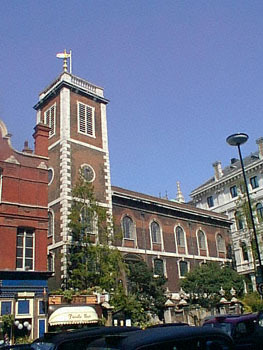 The church was destroyed in the Great Fire of London, and then rebuilt by Sir Christopher Wren. It again sustained heavy damage in the Blitz, and so the interior of today's church is a complete reconstruction within Wren's original walls.